With Memorial weekend and the 4th of July quickly approaching, I'm feeling a bit Patriotic! (Not to mention the upcoming Primary election!) So here is the little project I'm currently working on.... a pretty basic quilt with squares and hourglasses. It was seeing those little hourglasses that reminded me just how long it had been since I updated my blog! Found the idea for this over at That Girl That Quilt where Jennifer put together the sweetest little quilt all in pinks. It's been MANY years since I sat down to make a quilt and most of mine never progress beyond the top because I'm terrified of "messing up" the 3 B's.... batting, backing and binding!! That being said, following along with someone and watching A LOT of YouTube videos has given me the courage to give it a try. The top was finished about two weeks ago and I spent this last week trying to pick the perfect backing and binding material (ie: see I'm still terrified!! Ha Ha Ha) After making a trip to JoAnn's last week, I came home with a really pretty light blue with stars for the backing and a solid red for the binding, which I'm going to MAKE.... I know, can you believe it?! Next step? 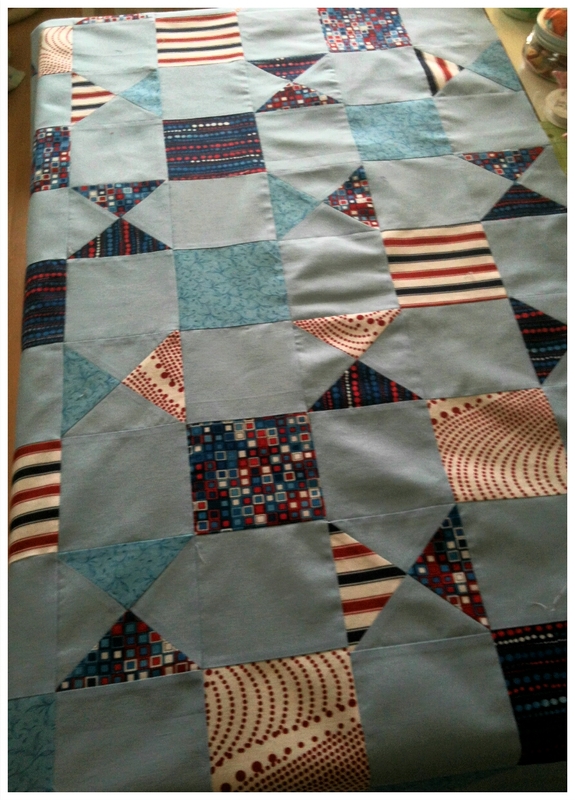 Laying everything out, pinning the layers together and getting read to quilt the top. This step will be a machine quilting and probably a pretty basic quilt in the ditch. 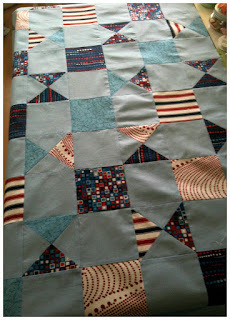 One of these days, soon I hope, I'll get to the freehand quilting but not with this one. Did all the ironing yesterday so the layers are nice and flat, and today will be the pinning!! Yay!! Have to keep going with the forward motion. I'll keep you posted as the progress continues. I have also been gardening, although a little less than I should. My backyard is a "work in progress" to say it nicely. My sweet little neighbor across the street offered to give me some of her old picket fencing and I was ECSTATIC!! Early in the Spring, I had plans for a new gardening or chicken area that was going to be fenced off from the regular yard and now I was going to have the fence to do it!! We cleared out our strawberries, took pictures off the internet, decided how large we wanted it, etc. etc. and I was so excited!! Then we decided against chickens when we found a pretty good price for farm fresh eggs. It was kind of sad and good all at the same time. No hassles, no having to be here all the time or find someone to watch pets, not having to "off" them at some point when they were no longer layers. So, now off to the gardening idea. It's nearly June friends and my yard still looks a lot like this... Over the last couple of weeks, once my Spring garden beds were all cleaned out the questioning began to my husband, "Are you going to try and finish this and move the beds or am I going to Summer plant where I'm at?" Maybe you can guess the answer.... That's right, still not done, no date in mind and the rest of my back yard looks a WHOLE lot worse than this area while the upheaval is happening. The older you get, the harder it is to wait on things. I've teased my husband a time or two that just when I get everything here looking the way I want it, we will either move or die!! Why can't I just have the space I want NOW and enjoy it? Oh well...... I'm sure with time it will all happen and be worth the wait. There are days when it just becomes one more "negative" thing in my already wild and chaotic life. The update? There will be more blogging here. It's not going to be all sugar coated though, because frankly, that isn't my life. Each day, probably like a lot of you, I set my intentions to find happy, positive things to focus on and do. Like attracts like right? And some days that works. But some days... well, to coin a phrase from my daughter, "It's like Hell on Earth" and there is just nothing you can do to make it better no matter how many times you "restart your day." So I will be sharing some of that here too, because that makes me REAL. And one thing I am is real!! If you're still with me on this blogging adventure, THANK YOU!! I hope to have much, MUCH more to share with you in the upcoming months.